STANFORD Debut winner sprinting at two! STANFORD Stakes Winner at three, four and five! STANFORD Grade 2 wire-to-wire stakes winner of $1.25 million Charles Town Classic. STANFORD Earned $1,385,510; winning six of his seventeen starts. STANFORD Set NTR for 8.5 furlongs! STANFORD $550,000 March Select Two-year-old graduate. 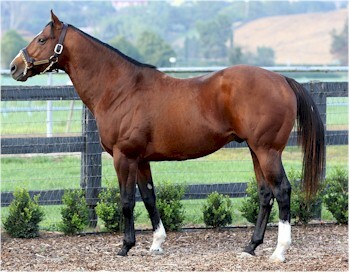 STANFORD Family of Pulpit, Johannesburg, Tale of the Cat and well regarded first year sire Fed Biz. STANFORD Second leading earner of Malibu Moon. STANFORD First foals arriving 2019! By MALIBU MOON (1997), Winner, $33,840. Sire of 15 crops. 1489 foals, 1172 starters, 102 black type winners, 846 winners, $97,697,778, including Declan’s Moon (Champion, $705,647), Orb ($2,612,516, Kentucky Derby [G1], etc. ), Carina Mia ($1,313,520, Acorn S. [G1], etc. ), Life At Ten ($1,277,515, Beldame S. [G1], etc. ), Gormley ($1,026,000, Santa Anita Derby [G1], etc. ), Devil May Care ($724,000, Frizette S. [G1], etc. ), Malibu Mint ($723,829, Princess Rooney Handicap [G1], etc. ), Ask the Moon ($713,640, Personal Ensign Invitational S. [G1], etc.). STANFORD (c, by Malibu Moon). Black type winner, see records. Hedge Fund (c, by Super Saver). Winner at 3, 2017, $170,160 in US. 2nd Illinois Derby [G3]. 3rd Sunland Derby [G3]. Save a Rose (f, by Super Saver). Winner at 2, $34,200 in US. Opening Move (c, by Bernardini). Winner at 3 and 4, $80,760 in US. Delay of Game (f, by Bernardini). Winner at 4, $77,660 in US. T. Montana (g, by Hard Spun). Winner at 2, $23,435 in US. Closing Move (f, by Bernardini). Placed at 2 to 4, $64,640 in US. JOHANNESBURG (c, by Hennessy). At 2 Champion 2yo Colt In Europe, Champion Two Year Old Colt, Hwt 2yo Colt In Ireland, Hwt Colt At 2 In England, Hwt Colt At 2 In France. Winner at 2, $520,000 in NA. Won Breeders’ Cup Juvenile S. [G1]. At 2 Sent to France, Sent to Great Britain. At 8 Sent to Australia. At 11 Sent To Japan . 2 wins at 2, in Eng, 120,000 GBP. 3 wins at 2, in Ire, 235,532 EUR. Winner at 2, in Fr, 125,465 EUR. Won Phoenix S. [G1] (IRE), Pr Morny [G1] (FR), Middle Park S. [G1] (ENG), Norfolk S. [G3] (ENG), Anglesey S. [G3] (IRE). 2nd Gladness S. [G3] (IRE). (Total: $1,015,599) Sire. Fairest Cape (f, by Storm Cat). 2 wins at 3, $44,642 in US. At 1 Sent to Ireland. Unplaced at 2, in Ire. (Total: $44,642) Producer. Sieg Emblem (c, by Storm Cat). Winner at 3, in Jpn, $49,428. MINARDI (c, by Boundary). At 2 Highweight 2yo Colt in England, Highweight 2yo Colt in Ireland. At 1 Sent to Great Britain. Winner at 2, in Eng, 106,385 GBP. Winner at 2, in Ire, 152,442 EUR. Unplaced at 3, in Fr. Won Heinz 57 Phoenix S. [G1] (IRE), Middle Park S. [G1] (ENG). 3rd Irish 2000 Guineas [G1] (IRE). (Total: $290,500) Sire. TALE OF THE CAT (c, by Storm Cat). 5 wins at 3 and 4, $360,900 in NA. Won King’s Bishop S. [G2]. 2nd Whitney Handicap [G1]. 3rd Vosburgh S. [G1], Vosburgh S. [G1]. At 13 Sent to Australia. Sire. FED BIZ (c, by Giant’s Causeway). 6 wins, 2 to 5, $770,496 in US. Won Pat O’Brien S. [G2], San Diego H. [G2], San Fernando S. [G2], El Cajon S. [L] (DMR, $60,000). 2nd Awesome Again S. [G1], Pat O’Brien S. [G2], Thunder Road S. (SA, $15,540). 3rd Frank E. Kilroe Mile S. [G1], Indiana Derby [G2], Strub S. [G2]. At 4 Ntr Del Mar 7f 01:21.12 (A). At 5 Ntr Del Mar 1 1/16m 01:41.00 (A). Weave It to Me. 3 wins at 4 and 5, $78,030 in US. Spunderful. 2 wins at 3, $71,720 in US. at 3, two wins Long Branch S., twice 2nd Louisiana Derby [G2], Winstar Farm Easy Goer S.
at 4, two wins Charles Town Classic S. [G2], Harlan’s Holiday S. [G3], twice 2nd Gulfstream Park H. [G2], Fred W. Hooper S. [G3]. at 5, one win Challenger S., once 2nd Poseidon H. At 5 Ntr Tampa Bay Downs 1 1/16m 01:41.75. March 2018 California Thoroughbred STANFORD TOP-CLASS SON OF MALIBU MOON WITH A TOP-CLASS SIRE’S PEDIGREE. February 2018 California Thoroughbred STANFORD TOP-CLASS SON OF MALIBU MOON WITH A TOP-CLASS SIRE’S PEDIGREE.